A village pub in Derbyshire has re-opened after two years of closure, with new facilities and new owners – the local community. 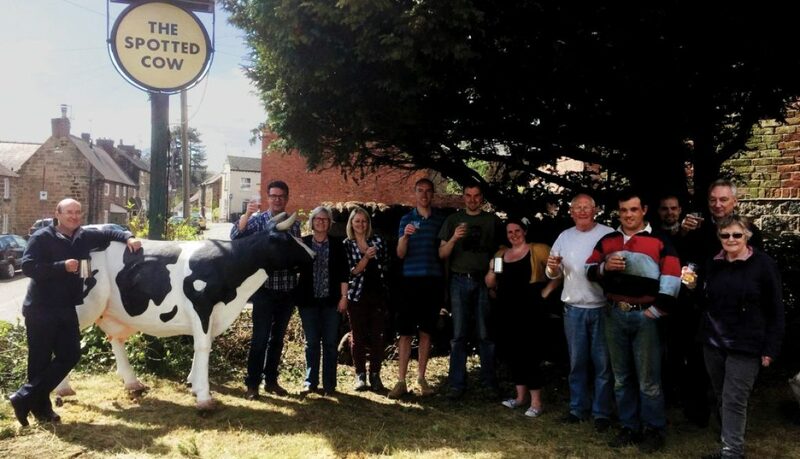 The Spotted Cow is now owned by a community benefit society with 225 members from the village of Holbrook and the surrounding area. They raised over £170,000 to finance the purchase, and The Co-operative Loan Fund and Co-operative & Community Finance assisted with loans for the refurbishment of the building. In addition to the pub, The Spotted Cow will also be home to a post office, café and B&B. Holbrook is a hilltop village on the edge of the Peak District National Park with views over the Derbyshire countryside. The Spotted Cow was reportedly a popular local in the past, with a cricket club and football team. But it hit hard times and was forced to close in 2015. In 2016, a planning application for the land was put in by a developer, which at a Parish Council meeting was overwhelmingly opposed. Instead, the residents nominated The Spotted Cow as an Asset of Community Value and launched a community share issue to raise the finance to buy the building. The purchase was completed on 13 April 2017, and the pub re-opened in July after refurbishment. The pub will be leased to a tenant, with the B&B, café and post office all being run by the Holbrook Community Society. Nearby to Holbrook is the Anglers Rest in Bamford, which became Derbyshire’s first community-owned pub in 2013. During planning, Stephanie visited the pub and was inspired by what had been accomplished by community ownership.